Pal payasam (paal payasam) aka rice milk pudding is a very classic Kerala dessert prepared during celebrations and festival seasons. Onasadhya / Kerala feast is never complete without serving paal payasam at the end. This is an easy to prepare pal payasam recipe with just three ingredients. I hope, you all will try this and let me know your comments. Wash and thoroughly dry the white rice. Give a pulse movement in a mixer (for 2 sec). Keep a pressure pan on the stove, Flame it and pour the milk in it. Add sugar, stir it until the sugar dissolves. Lower the flame and keep it in sim. Later add cracked white rice. Stir for a minute and close the cooker lid tightly. Put the weight on and let it cook for 30-35 minutes. Do not allow the whistle to come. If the whistle is about to come, switch it off for some time and again flame it in sim. Adjust the cooking time for around 35 minutes. Switch it off and leave as it is. The more time you keep it untouched, the more it tastes good and thus the color changes from white to pink!! Do not add any fragrance/spices or nuts. The payasam is as delicious as it is! Check these payasam recipes also. 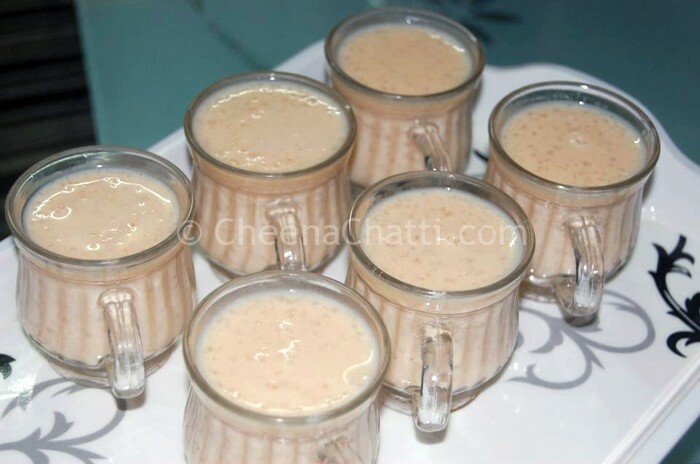 How to make Parippu payasam / Parippu pradhaman? How to make Kadala Parippu Payasam / Chana dal kheer? How to make aval payasam / poha at home? This entry was added on August 21st, 2013 by Athira Sooraj in Desserts and tagged with paal payasam recipe kerala, vishu payasam, sadhya, onasadhya, how to make kerala payasam, onam recipes, onam payasam, kerala sadhya, kerala payasam. Last revised on April 4th, 2018. The recipe looks really delicious. I wish to try once with your assistance. Could you tell me what amount of rice, milk and sugar I need to make 20 cups paal payasam? You just need to take the ingredients proportionately. So if you need it for 20 cups take three times the ingredients mentioned. We prepared for around 40 peoples last week just by taking 6 times the ingredients mentioned here. The preparation was good. Thanks for the recipe chechi. We prepared it last week for a party. We followed the exact steps. The payasam was superb. A small tip: You can know that the rice is cooked completely when it starts floating. I didn’t knew this. So initially I thought my preparation went wrong, because it was just like milk with whole rice at the bottom. Then mother told that you have to cook it until rice floats on the surface. Tried today for our wedding anniversary. turned out to be a hit! Our guests enjoyed the payasam. Thank you for sharing the recipe. Glad to know that Lakshmi. Thanks for trying the recipe.